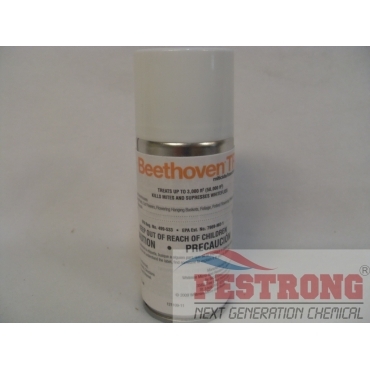 Where to Buy Beethoven TR, Beethoven TR Total Release Fogger - 2 oz - $21.95 for Sale with Fast Free Shipping! Beethoven TR Total Release Fogger - 2 oz provides greater control of greenhouse pests with rotation. Surekill LD-44T Z33 Timemist Metered..
Beethoven TR miticide/insecticide, with the active ingredient etoxazole, is a new total release aerosol from BASF. It provides control of mites, including the two-spotted spider mite, and suppresses whiteflies. In addition, Beethoven TR offers quick and easy application, thorough coverage, excellent plant safety and flexible re-entry times. This unique total release formulation is also a great Space Mix partner with other BASF total release insecticides, including Attain, 1300 Orthene, Tame/Orthene, Pyrethrum and Duraplex, giving growers another easy-to-use rotation option for even greater control of greenhouse pests. Commercial greenhouses on bedding plants, cut flowers, hanging baskets, foliage, potted plants and ornamentals for control of Mites, including two-spotted spider mites, Whiteflies (suppression). The active ingredient etoxazole is classified as a mite growth regulator and is most effective on eggs and youngest immature stages. Activity is by contact and ingestion. As a growth regulator, activity is slow, so Beethoven should not be used to reduce a well-established spider mite (or whitefly) infestation. Products with rapid activity on nymphs and adults should be added to the rotation. See full label for additional label restrictions. I know this is best miticide option for greenhouse. It provides good combination of other BASF total release fogger because it contains IGR. I recommend this to remove mite problem. It is excellent total release miticide ever with long residual. It works. I have used beethoven TR for my green house mite control. I love this that work fast and widely.